Samsung will unveil the Galaxy S10 lineup on February 20, with the company’s foldable smartphone also expected to make an appearance. 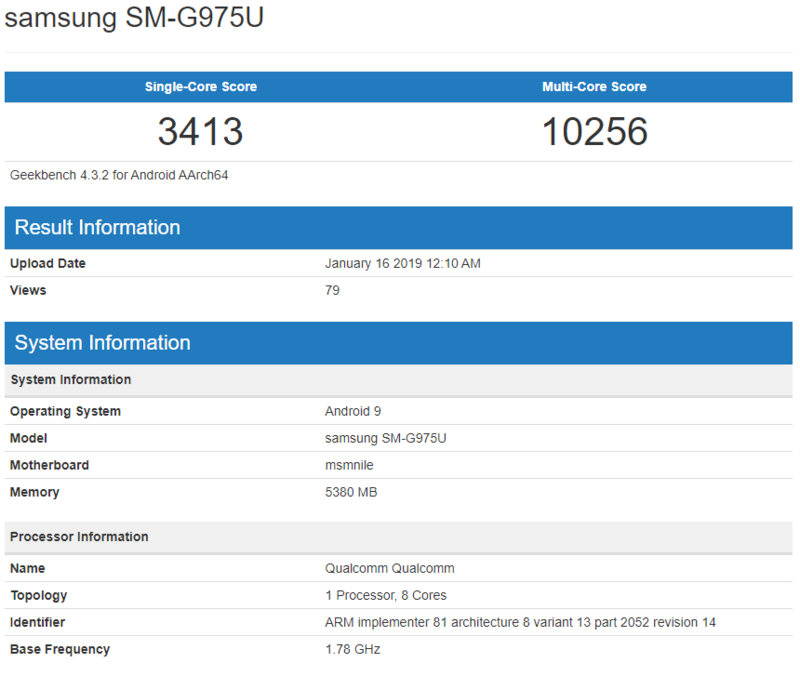 This means that prior to the announcement, there are going to be a hefty number of leaks surrounding both handsets, and with the latest leak, the Galaxy S10 Plus has been spotted on Geekbench boasting some impressive scores and specifications. Let us have a look in detail at what Samsung has got in store for us down the road. This particular model features the number SM-G975U, and the scores are reminiscent of what a Snapdragon 855-fueled flagship will perform. The single-core score is 3413, while the device obtains 10256 in the multi-core test results. While this version features 6GB of RAM, we feel it could be the base model. An 8GB RAM variant could also be getting tested in the future, with different rumors saying the smartphone could feature up to 12GB RAM. The tested handset is also running Android 9 Pie, which is expected, but no other details are provided. According to previous rumors, Samsung will use a 6.44-inch display for the Galaxy S10 Plus and the company plans to incorporate a dual-camera at the front with a punch-hole to maximize the screen-to-body ratio. Thanks to its sheer size, the Galaxy S10 Plus will reportedly feature a 4000mAh battery and here’s the good news. If you plan on upgrading to the 5G version of the Galaxy S10 Plus, the latter is rumored to sport a 5000mAh capacity. Other specifications of the Galaxy S10 Plus include a triple camera at the back, meaning the flagship will have a total of five cameras. It’s not confirmed what the true functionality of the triple camera setup will be, but we believe one of the sensors will be used for wide-angle shots, while the third one will be for zooming purposes. Aside from the Galaxy S10 Plus, Samsung is planning to launch the regular Galaxy S10 too, which is reported to fetch a 6.1-inch screen. As for the most affordable Galaxy S10 model, it’s rumored to feature a 5.8-inch display and will carry the name Galaxy S10 E. All models are expected to be fueled by the Snapdragon 855, with some extensive benchmarks showing that the silicon is indeed a mobile powerhouse. We should expect the same from the Galaxy S10 Plus, so stay tuned for more updates about Samsung’s premium Galaxy S family down the road. Galaxy S10 Plus - How Much Does It Cost Samsung to Make a Single Unit of Its Latest Flagship?